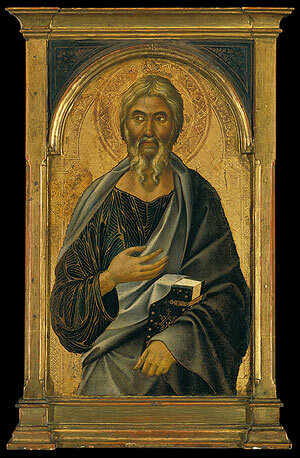 Saint John, Apostle and Evangelist. 1. “That which was from the beginning, which we have heard, which we have seen with our eyes, and our hands have handled, of the word of life.” Who is he that with hands doth handle the Word, except because “The Word was made flesh, and dwelt in us”? Now this Word which was made flesh that it might be handled, began to be flesh, of the Virgin Mary: but not then began the Word, for the Apostle saith, “That which was from the beginning.” See whether his epistle does not bear witness to his gospel, where ye lately heard, “In the beginning was the Word, and the Word was with God.” Perchance, “Concerning the word of life” one may take as a sort of expression concerning Christ, not the very body of Christ which was handled with hands. See what follows: “And the Life was manifested.” Christ therefore is “the word of life.” And whereby manifested? For it was “from the beginning,” only not manifested to men: but it was manifested to angels, who saw it and fed on it as their bread. But what saith the Scripture? 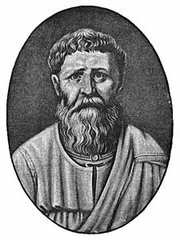 “Man did eat angels’ bread.” Well then “the Life was manifested” in the flesh; because it exhibited in manifestation, that that which can be seen by the heart only, should be seen by the eyes also, that it might heal the hearts. For only by the heart is the Word seen: but the flesh is seen by the bodily eyes also. We had wherewith to see the flesh, but had not wherewith to see the Word: “the Word was made flesh,” which we might see, that so that in us might be healed wherewith we might see the Word. 2. “And we have seen and are witnesses.” Perhaps some of the brethren who are not acquainted with the Greek do not know what the word “witnesses” is in Greek: and yet it is a term much used by all, and had in religious reverence; for what in our tongue we call “witnesses,” in Greek are “martyrs.” Now where is the man that has not heard of martyrs, or where the Christian in whose mouth the name of martyrs dwelleth not every day and would that it so dwelt in the heart also, that we should imitate the sufferings of the martyrs, not persecute them with our cups! Well then, “We have seen and are witnesses,” is as much as to say, We have seen and are martyrs. For it was for bearing witness of that which they had seen, and bearing witness of that which they had heard from them who had seen, that, while their testimony itself displeased the men against whom it was delivered, the martyrs suffered all that they did suffer. The martyrs are God’s witnesses. It pleased God to have men for His witnesses, that men also may have God to be their witness. “We have seen,” saith he, “and are witnesses.” Where have they seen? In the manifestation. What meaneth, in the manifestation? In the sun, that is, in this light of day. And how should He be seen in the sun who made the sun, except as “in the sun He hath set His tabernacle; and Himself as a bridegroom going forth out of his chamber, exulted as a giant to run His course?” He before the sun, who made the sun, He before the day-star, before all the stars, before all angels, the true Creator, (“for all things were made by Him, and without Him was nothing made,”) that He might be seen by eyes of flesh which see the sun, set His very tabernacle in the sun, that is, showed His flesh in manifestation of this light of day: and that Bridegroom’s chamber was the Virgin’s womb, because in that virginal womb were joined the two, the Bridegroom and the bride, the Bridegroom the Word, and the bride the flesh; because it is written, “And they twain shall be one flesh;” and the Lord saith in the Gospel, “Therefore they are no more twain but one flesh. And Esaias remembers right well that they are two: for speaking in the person of Christ he saith, “He hath set a mitre upon me as upon a bridegroom, and adorned me with an ornament as a bride.” One seems to speak, yet makes Himself at once Bridegroom and Bride; because “not two, but one flesh:” because “the Word was made flesh, and dwelt in us.” To that flesh the Church is joined, and so there is made the whole Christ, Head and body. 3. “And we are witnesses, and show unto you that eternal life, which was with the Father, and was manifested unto us:” i.e., manifested among us: which might be more plainly expressed, manifested to us. “The things,” therefore, “which we have seen and heard, declare we unto you.” Those saw the Lord Himself present in the flesh, and heard words from the mouth of the Lord, and told them to us. Consequently we also have heard, but have not seen. Are we then less happy than those who saw and heard? And how does he add, “That ye also may have fellowship with us”? Those saw, we have not seen, and yet we are fellows; because we hold the faith in common. For there was one who did not believe even upon seeing, and would needs handle, and so believe, and said, “I will not believe except I thrust my fingers into the place of the nails, and touch His scars.” And He did give Himself for a time to be handled by the hands of men, who always giveth Himself to be seen by the sight of the angels; and that disciple did handle, and exclaimed, “My Lord, and my God!” Because he touched the Man, he confessed the God. And the Lord, to console us who, now that He sitteth in heaven, cannot touch Him with the hand, but only reach Him with faith, said to him, “Because thou hast seen, thou hast believed; blessed are they that have not seen, and yet believe.” We are here described, we designated. Then let the blessedness take place in us, of which the Lord predicted that it should take place; let us firmly hold that which we see not; because those tell us who have seen. “That ye also,” saith he, “may have fellowship with us.” And what great matter is it to have fellowship with men? Do not despise it; see what he adds: “and our fellowship may be with God the Father, and Jesus Christ His Son. And these things,” saith he, “we write unto you, that your joy may be full.” Full joy he means in that fellowship, in that charity, in that unity. 4. “And this is the message which we have heard of Him, and declare unto you.” What is this? Those same have seen, have handled with their hands, the Word of life: He “was from the beginning,” and for a time was made visible and palpable, the Only-begotten Son of God. For what thing did He come, or what new thing did He tell us? What was it His will to teach? Wherefore did He this which He did, that the Word should be made flesh, that “God over all things” should suffer indignities from men, that He should endure to be smitten upon the face by the hands which Himself had made? What would He teach? What would He show? What would He declare? Let us hear: for without the fruit of the precept the hearing of the story, how Christ was born, and how Christ suffered, is a mere pastime of the mind, not a strengthening of it. What great thing hearest thou? With what fruit thou hearest, see to that. What would He teach? What declare? Hear. That “God is light,” saith he, “and there is no darkness in Him at all.” Hitherto, he hath named indeed the light, but the words are dark: good is it for us that the very light which he hath named should enlighten our hearts, and we should see what he hath said. This it is that we declare, that “God is light, and there is no darkness in Him at all.” Who would dare to say that there is darkness in God? Or what is the light? Or what darkness? Lest haply he speaks of such things as pertain to these eyes of ours. “God is light.” Saith some man, “The sun also is light, and the moon also is light, and a candle is light.” It ought to be something far greater than these, far more excellent, and far more surpassing. How much God is distant from the creature, how much the Maker from the making, how much Wisdom from that which is made by Wisdom, far beyond all things must this light needs be. And haply we shall be near to it, if we get to know what this light is, and apply ourselves unto it, that by it we may be enlightened; because in ourselves we are darkness, and only when enlightened by it can we become light, and not be put to confusion by it, being put to confusion by ourselves. Who is he that is put to confusion by himself? He that knows himself to be a sinner. Who is he that by it is not put to confusion? He who by it is enlightened. What is it to be enlightened by it? He that now sees himself to be darkened by sins, and desires to be enlightened by it, draws near to it: whence the Psalm saith, “Draw near unto Him, and be ye enlightened; and your faces shall not be ashamed.” But thou shalt not be shamed by it, if, when it shall show thee to thyself that thou art foul, thine own foulness shall displease thee, that thou mayest perceive its beauty. This it is that He would teach. 5. And may it be that we say this over-hastily? Let the apostle himself make this plain in what follows. Remember what was said at the outset of our discourse, that the present epistle commendeth charity: “God is light,” saith he, “and in Him is no dark ness at all.” And what said he above? “That ye may have fellowship with us, and our fellowship may be with God the Father, and with His Son Jesus Christ.” But moreover, if “God be light, and in Him is no darkness at all, and we must have fellowship with Him,” then from us also must the darkness be driven away, that there may be light created in us, for darkness cannot have fellowship with light. To this end, see what follows: “If we say that we have fellowship with Him, and walk in darkness, we lie.” Thou hast also the Apostle Paul saying, “Or what fellowship hath light with darkness?” Thou sayest thou hast fellowship with God, and thou walkest in darkness; “and God is light, and in Him is no darkness at all:” then how should there be fellowship between light and darkness? At this point therefore a man may say to himself, What shall I do? how shall I be light? I live in sins and iniquities. There steals upon him, as it were, a desperation and sadness. There is no salvation save in the fellowship of God. “God is light, and in Him is no darkness at all.” But sins are darkness, as the Apostle saith of the devil and his angels, that they are “rulers of this darkness.” He would not call them of darkness, save as rulers of sins, having lordship over the wicked. Then what are we to do, my brethren? Fellowship with God must be had, other hope of life eternal is none; now “God is Light, and in Him is no darkness at all:” now iniquities are darkness; by iniquities we are pressed down, that we cannot have fellowship with God: what hope have we then? Did I not promise to speak something during these days, that shall cause gladness? Which if I make not good, this is sadness. “God is Light, and in Him is no darkness at all;” sins are darkness: what shall become of us? Let us hear, whether peradventure He will console, lift up, give hope, that we faint not by the way. For we are running, and running to our own country; and if we despair of attaining, by that very despair we fail. But He whose will it is that we attain, that He may keep us safe in our own land, feedeth us in the way. Hear we then: “If we say that we have fellowship with Him and walk in darkness, we lie, and do not the truth.” Let us not say that we have fellowship with Him, if we walk in darkness. “If we walk in the light, as He is in the light, we have fellowship one with another.” Let us walk in the light, as He is in the light, that we may be able to have fellowship with Him. And what are we to do about our sins? Hear what follows, “And the blood of Jesus Christ His Son shall purge us from all sin.” Great assurance hath God given! Well may we celebrate the Passover, wherein was shed the blood of the Lord, by which we are cleansed “from all sin!” Let us be assured: the “handwriting which was against us,” the bond of our slavery, the devil held, but by the blood of Christ it is blotted out. “The blood,” saith he, “of His Son shall purge us from all sin.” What meaneth, “from all sin”? Mark: lo even now, in the name of Christ whom these here have now confessed, who are called infants, have all their sins been cleansed. They came in old, they went out new. How, came in old, went out new? Old men they came in, infants they went out. For the old life is old age with all its dotage, but the new life is the infancy of regeneration. But what are we to do? The past sins are pardoned, not only to these but to us; and after the pardon and abolition of all sins, by living in this world in the midst of temptations, some haply have been contracted. Therefore what he can, let man do; let him confess himself to be what he is, that he may be cured by Him who always is what He is: for He always was and is; we were not and are. 6. For see what He saith; “If we say that we have no sin, we deceive ourselves, and the truth is not in us.” Consequently, if thou hast confessed thyself a sinner, the truth is in thee: for the Truth itself is light. Thy life hath not yet shone in perfect brightness, because there are sins in thee; but yet thou hast already begun to be enlightened, because there is in thee the confession of sins. For see what follows: “If we confess our sins, He is faithful and just to forgive us our sins, and to purge us from all iniquity.” Not only the past, but haply if we have contracted any from this life; because a man, so long as he bears the flesh, cannot but have some at any rate light sins. But these which we call light, do not thou make light of. If thou make light of them when thou weighest them, be afraid when thou countest them. Many light make one huge sin: many drops fill the river; many grains make the lump. And what hope is there? Before all, confession: lest any think himself righteous, and, before the eyes of God who seeth that which is, man, that was not and is, lift up the neck. Before all, then, confession; then, love: for of charity what is said? “Charity covereth a multitude of sins.” Now let us see whether he commendeth charity in regard of the sins which subsequently overtake us: because charity alone extinguisheth sins. Pride extinguisheth charity: therefore humility strengtheneth charity; charity extinguisheth sins. Humility goes along with confession, the humility by which we confess ourselves sinners: this is humility, not to say it with the tongue, as if only to avoid arrogancy, lest we should displease men if we should say that we are righteous. This do the ungodly and insane: “I know indeed that I am righteous, but what shall I say before men? If I shall call myself righteous, who will bear it, who tolerate? let my righteousness be known unto God: I however will say that I am a sinner, but only that I may not be found odious for arrogancy.” Tell men what thou art, tell God what thou art. Because if thou tell not God what thou art, God condemneth what He shall find in thee. Wouldest thou not that He condemn thee? Condemn thou. Wouldest thou that He forgive? do thou acknowledge, that thou mayest be able to say unto God, “Turn Thy face from my sins.” Say also to Him those words in the same Psalm, “For I acknowledge mine iniquity.” “If we confess our sins, He is faithful and just to forgive us our sins, and to purge us from all iniquity. If we say that we have not sinned, we make Him a liar, and His word is not in us.” If thou shalt say, I have not sinned, thou makest Him a liar, while thou wishest to make thyself true. How is it possible that God should be a liar, and man true, when the Scripture saith the contrary, “Every man a liar, God alone true”? Consequently, God true through Himself, thou true through God; because through thyself, a liar. 8. See John himself observing humility. Assuredly he was a righteous and a great man, who from the Lord’s bosom drank in the secrets of His mysteries; he, the man who by drinking from the Lord’s bosom indited of His Godhead, “In the beginning was the Word, and the Word was with God:” he, being such a man as this, saith not, Ye have an advocate with the Father; but, “If any man sin, an advocate,” saith he, “have we.” He saith not, ye have; nor saith, ye have me; nor saith, ye have Christ Himself: but he puts Christ, not himself, and saith, also, “We have,” not, ye have. He chose rather to put himself in the number of sinners that he might have Christ for his advocate, than to put himself in Christ’s stead as advocate, and to be found among the proud that shall be condemned. Brethren, Jesus Christ the righteous, even Him have we for our advocate with the Father; “He,” even He, “is the propitiation for our sins.” This whoso hath held fast, hath made no heresy; this whoso hath held fast, hath made no schism. For whence came schisms? When men say, “we” are righteous, when men say, “we” sanctify the unclean, “we” justify the ungodly; “we” ask, “we” obtain. But what saith John? “And if any man sin, we have an advocate with the Father, Jesus Christ the righteous.” But some man will say: then do the saints not ask for us? Then do bishops and rulers not ask for the people? Yea, but mark the Scriptures, and see that rulers also commend themselves to the prayers of the people. Thus the apostle saith to the congregation, “Praying withal for us also.” The apostle prayeth for the people, the people prayeth for the apostle. We pray for you, brethren: but do ye also pray for us. Let all the members pray one for another; let the Head intercede for all. Therefore it is no marvel that he here goes on and shuts the mouths of them that divide the Church of God. For he that has said, “We have Jesus Christ the righteous, and He is the propitiation for our sins:” having an eye to those who would divide themselves, and would say, “Lo, here is Christ, lo, there;” and would show Him in a part who bought the whole and possesses the whole, he forthwith goes on to say, “Not our sins only, but also the sins of the whole world.” What is this, brethren? Certainly “we have found it in the fields of the woods,” we have found the Church in all nations. Behold, Christ “is the propitiation for our sins; not ours only, but also the sins of the whole world.” Behold, thou hast the Church throughout the whole world; do not follow false justifiers who in truth are cutters off. Be thou in that mountain which hath filled the whole earth: because “Christ is the propitiation for our sins; not only ours, but also the sins of the whole world,” which He hath bought with His blood.